Posted on 2016-06-18 21:15:29 GMT+0000 by Neil Godfrey. This entry was posted in Uncategorized and tagged Hermann Detering, Richard Carrier. Bookmark the permalink. I have just come from an online interview session with Richard Carrier but unfortunately the combination of lack of structure and less than optimal google hangout connection left me leaving without having raised my questions, which were attempting to zero in on this and related areas of interest among readers of Carrier. But I have emailed copies of the questions to him so hopefully he will respond in due course on his blog. I was disappointed in the session. I had expected a controlled meeting where specific issues of concern would be methodically addressed. Not so. I don’t feel comfortable just sharing the same thoughts about us and them. Maybe I am older than them and having shorter to live and more impatient for something new that is constructive and productive. I think a lot has to do with the postmodern way of holding meetings (Robert’s Rules of Order are thrown out the window) initiated by the New Left in the 1960. Which means nothing gets done, and if something happens within a group that its “leaders” — read strongest personalities are offended at, the next meeting will quickly degenerate into a circular firing squad. 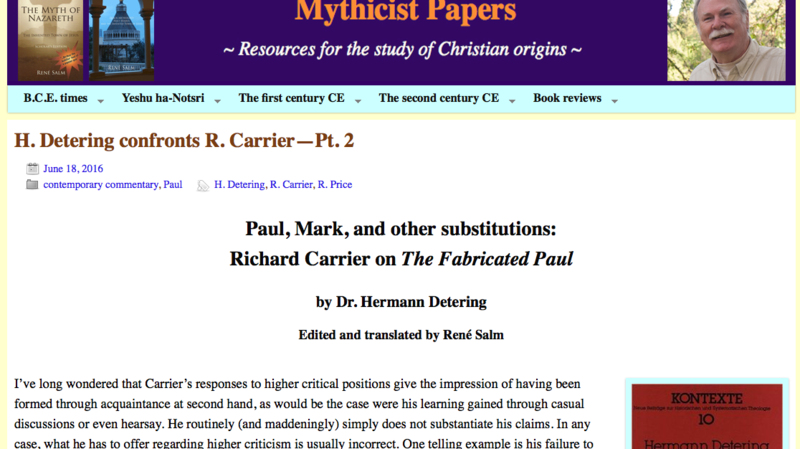 “He routinely (and maddingly) does not substantiate his case” for an historical Paul (R. Salm). I think all Richard Carrier has to go by is scholarly consensus. And I think he instinctively knows that if he were to go against scholarly consensus on Paul, no-one would even hear his arguments for the ahistoricity of Jesus. Yeah, this doesn’t seem like a fair criticism. Piling on additional questions about long-held orthodoxy would just make his argument more problematic. Better to lay the focus where it belongs and leave other debates for another day. The best thing about Carrier’s work is that he takes mainstream assumptions and unlike the mainstream theologians, he draws logical conclusions from them. Even if we can’t be certain these assumptions are valid, his case is a valid what-if scenario. Of course there’s a good chance all christian literature is spurious, but then we can’t really tell anything. I recall he explicitly says in OHJ that he won’t challenge a consensus view if he feels he can’t make a strong enough case against it, even if he doesn’t quite believe it’s valid. As to the historicity of Paul, I agree it’s of little importance if an actual guy named Paul wrote any of it in the mid first century. What matters is where the epistles belong in the chain of literature. Still not impressed. I’ve just written a reply comment to Salm over there. No fan of Paul Mythicism but that’s a slam dunk response by Detering, Carrier shouldn’t have questioned his credentials.